Words added at no extra charge. Other animals available on request. Approximately 7 inches tall, 4 inches wide. There is a hole and rubber bung in the base. Please let me know what name you would like on the heart. I can glaze it in different colours if you prefer. Please specify the wording you would like added. Your choice of words added at no extra cost. 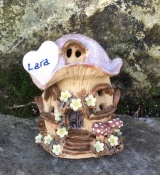 This money box can be made with or without a small heart on the roof where a name can be added at no extra cost. There is a rubber stopper on the base. This was made as a commission for a garden studio. 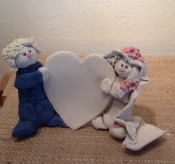 If you would like us to make something similar, please email us with some details and we can work out a price for you. 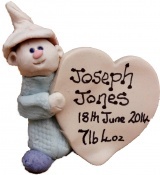 We use a stoneware clay which is frost proof. I'm happy to write a name or message for no extra cost.